Is It Unethical For Architects To Market Or Advertise Their Firm? Is Marketing against your Ethics? Marketing has no place in architecture – it’s a gentleman’s profession in which you don’t promote yourself or advertise. Hanging your shingle up and doing exceptional work should be enough. Now I don't know if this guy is pulling our leg, but it makes me ask the question: Is architecture a “gentleman's profession”? Does promotion and advertising run against your grain? 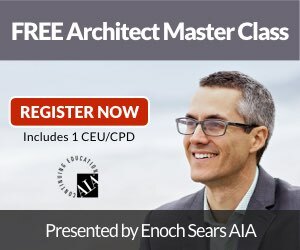 What do you think about marketing for architects? Tell me – Is a add for new projects in a local CA journal/news letter with the words “licensed architect” cause for disciplinary action if you are in fact a licensed CA architect? Not according to my knowledge Sandi. Only if the person is not a licensed architect. These are all great comments. It reminds me of when I was in architecture school (late ’90s – early ’00s) and the instructors all wanted us to hand draw all our work. When we asked about using CAD we were told that ‘that is how I learned.’ That was all great and romantic but did no one any good when employers wanted CAD drafters. We just wanted to get our foot in the door. 🙂 I am all for drawing skills but you have to be cognizant of current trends and be willing to embrace them. Social media is here to stay. Embrace it or get left behind. Why do we want to be so cutting edge when it comes to design and materials but not other aspects of our society? Marketing should be a constant, advertising occasional, and networking with potential clients and peers always. Actually in Croatia, the chamber of architects prohibits its members to advertise in any shape or form. We can have a webpage or get published and that’s it. Once upon a time, advertising was consider unprofessional and sleezy with association to sleezy marketers like the used car salesman. Professional culture like lawyers and doctors at that time never advertised. It was the notion that, word of mouth and good practice was the way to run a practice. It also must be remembered that architecture was not a CORPORATE profession. Ok, there existed firms that were incorporated for legal benefits that comes with the territory but the profession wasn’t mega-corporations with 1000+ employees. They were usually local firms. Most of the incorporated ones were in cities where they may have a group of co-owners and had a mild staff of draughtsmen. The way we engage in business today would be viewed as debauchery in those days and they way we engage in business today would get alot of architects to lose their license but there is a difference in the values and what the measure of acceptable and unacceptable. It is a moving target. In addition, it was also in that time that AIA members were forbidden by AIA at the time. Lets also remember that AIA was engaged in activity that lead to them being sued by the Federal government for antitrust violations including price fixing. This is not allowed legally. We live in a different culture with different values. Some of that stigma was well into the psyche until the 1980s and 1990s. But remember that in the first half of the 20th century, we enforced public health, safety, welfare and MORALS. The latter is something that drifted out of favor on a legal stance due to various case rulings in the 1950s, 60s, 70s… And is now no longer being enforced because legal enforcement standards of today requires an OBJECTIVE benchmark on making decisions on any judicial and quasi-judicial proceedings. Any subjectivity is unacceptable at a point in time. Remember that laws and how culture does things is reflective of the cultural values in a given time and given place. The person maybe an old timer. Keep in mind that these were very real ans not just pulling a person’s leg. In some places, architects did lose their license for advertising at one point in time. I am a marketer in NJ (imprinsic) who has a meeting with a local architect coming up. I’m not sure what I am going to try to sell him on. This post and these comments taught me how these professionals seem to think. It kind of reminds me of the traditional English gentleman. Either way, thank you for posting this. I’m still not sure what my proposal will have in it. But, I am positive what it WON’T have in it! Ha! Yes, stay away from direct mail and heavy copy… ;). With architects, the strategy is all about the niche of that particular architect. The strategy varies greatly based on the niche…best of luck Matt! Agree with niching with the architect but I’ve successfully used direct mail with ‘heavy’ copy so I wouldn’t discount that. the work came from multiple mailings, not just one. Last time I went after a market sent 12 letters to the same target of 235 builders and we were flooded with work. Hi String, I am curious how you have successfully used direct mail with heavy copy and mutiple mailings…do you mind sharing how you got a lot of work from doing it? It had been illegal for professionals to advertise (see (The Bates vs. State Bar of Arizona for a discussion on the matter). We can now. I don’t know about ADVERTISING. What should it be? Outdoor billboards? But marketing is something else. I don’t know if any business could ever survive without a marketing strategy. Even if an architect decides that he/she will not use advertising/marketing tips and just provide cutting edge design submissions to famous competitions, actually it is a marketing strategy. An architect should be noticed and hired in the first place and he/she must be visible somewhere. The “networking” seems the worst solution. If you go to the Commerce Chamber and hang out with the boys…. what could you do? “I am an architect, we live in the same city, if you have any job, call me”?. On what premises? So a good communication campaign where you target people that actually have to build it seems to me the only rational choice. Octavian, great distinction between advertising and a marketing strategy! Thanks for clearing this up for me. I think your comment is spot on. Also thanks for sharing your experience – it helps those of us who are looking for a better way. Marketing is the strategy (read: theory) you use in order to get work. It is always consistent with your ethics, because it is the way that you are pursuing work. Advertising is how you implement your strategy. It is the communication that you exist, etc. If your marketing is successful, you will have work. If it is unsuccessful, you won’t. If you don’t have work, you need to change your strategy. Charles – I couldn’t have said it better myself. Thanks for the comment. Traditionally, advertising by architects was frowned upon – no print, radio, TV advertising. But what happened around 2007-2008? The AIA began advertising the architecture profession on radio and national TV. Architects needed work, and education through advertising was a way to get the attention of potential clients. As Brinn pointed out, “hanging up a shingle” is a form of advertising (difficult to do it you’re a sole proprietor working from home or a coffee shop), and the AIA online forum is definitely a form of social media – TOI is socializing with those who have similar interests using digital media. In many cases the traditions of architecture have held us back. The profession has been very slow to embrace the very characteristics of the Internet and social media that we were taught in architecture school: design and communication. In general, architects have some of the dullest websites on line, and instead of using social media to educate prospects as to why they need a architect for any building project, the profession shies away. Unwilling to explore – which is against what I learned in school – or afraid another professional will steal their ideas? Karen, awesome comment. Interesting parallel you make about design and communication being some of our key attributes but social media not being more readily adopted. I know many architects are justifiably intimidated by this new technology. Stereotypes about the frivolity of social media (what I had for breakfast, cat videos, etc) also leads many to think social media is for prepubescent teens. Please explain more about what traditions of architecture you are referring to when you say they are holding us back. Social media is very important, and I would say it has now become a form of “hanging out your shingle”. I need to be online and engaging with people or get left behind, especially since I work from my home office and don’t have a prominent place of work. Kelly, great point about using social media to feel ‘social’ even though you work alone. Do you live in an area where many locals are on SM, or are you interacting with other people across the world (i.e. not limited by geography)? Twitter is a way of keeping good company. In many ways it is a modern method of networking and marketing architecture similar to how it’s always been done. It is all about who knows you and who trusts you. Twitter is an exceptional tool for maintaining and growing that on a global scale. Kiel, great point, you summed it up well. Its just ol’ fashioned networking facilitated (and amplified) by technology. I’m not sure whether to laugh, sigh or roll my eyes. First, you have to understand what this person means by ‘gentleman’s profession’. From the context, I’d think this person believes that propriety and manners dictate that one does not boast about self. In this regard, he takes it a step further and applies this principle to boasting about one’s profession or business. While I can get on board with holding my tongue and not blabbing to the world (who doesn’t care) about how great I am, to say this same rule applies in business is well, absurd. The purpose of business is to get customers and make money. Whether you sell to other businesses or the individual, if you don’t sell your widgets or your service, you’ll go under. Not all business operate on a word-of-mouth basis, and it is unfair to say that those that do not shouldn’t leverage another means of gaining customers. It seems that this person had blurred the principle and application to the point of getting confused. I would guess that this person either a) practices traditional design and architecture or b) is very old (or both). For clients who prefer traditional design (and most times it is expensive traditional design), networking in person will tend to win out over virtual networking. It is just how that client base works. But to make a blanket statement that ‘social networking has no place in architecture’ shows a narrow-mindedness as to what type of architecture this person approves of: his. There are other corners of the market that this individual is not capitalizing on, and instead of allowing others to exploit these niches in their own way, he cleverly demeans them by saying they are socially inappropriate if they use social media to network and draw in business. It shows a limited understanding of the breadth of architecture (or at least a rejection of it), and an arrogant attitude that does not make room for others with different ideas or practices. To distill the idea, one could argue that ‘social networking’ is simply another word for ‘advertising’; So if this person doesn’t believe that advertising is permissible (socially), then even the act of putting out a shingle would go against his purported beliefs – debunking his entire theory. Am I the only one that sees irony in the fact that he’s using an online forum to convey his opinion? If you don’t promote yourself no one will know what a design genius you are. Almost all the great architects were not only great at design but also at letting everyone know about it. The tortured artist who is discovered in his garage surrounded by masterpieces is a big fat lie. Jared, thanks for the comment. Good point about great architects not only being great at design but also at letting everyone know about it. This isn’t something broadcast loudly, but it is true. Unfortunately there seems to exist the myth, as you put it, about being discovered on raw talent. Ha. So the question is, how do we best “let everyone know about it?”. This is true. Consider the differences between Pei and Khan. Architecture IS a gentleman’s profession. HOWEVER, simply hanging up your shingle and doing exceptional work isn’t enough. No one is going to come into your office simply by spotting your shingle. You must network. You must advertise that you have hung up your shingle. Most importantly it must be kept in mind that the new up and coming generation of clients are more mobile and want to converse on THEIR terms. That means conversing on social media. It’s simple, you need to be active in the medium your target clients are active in. Wake up, technology has brought about a new world order of connectivity and productivity. And my final thought . . . the kids that are graduating from architecture schools now think it is normal to converse by texting and facebooking. You can’t beat them, so join them. Ed, ha! If you can’t beat them, join them. I like that. Thanks for you comment and input on the reality of ‘hanging out a shingle’.